Located around 4 hours west of the traditional French alpine reports Super Besse is a hidden gem. The 1960s purpose built ski resort has a reputation for not being the prettiest of places. Rustic log cabins are replaced by concrete but not in an aesthetically unpleasing way. A location with unique charm nestled in the footprint of a long extinct volcano. With a maximum altitude of 1,860m its not as snow sure as some of the higher and more commercial resorts but peak season it has sufficient snow cover and some 350 snow cannons to keep all its main pistes open. 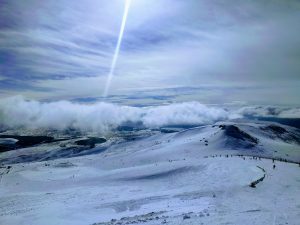 They seemed to have crammed in a little of everything from extensive cross country tracks to a snow park, jumps and a 2km long Tyrolienne situated close to the summit for those us more daring and light enough! When viewed from the highest vantage it feels a little like being on an iceberg surrounded by green rolling vistas. Given its relative low altitude The approach to the resort is akin to a leisurely drive in wales with not a switch back or hair raising mountain clinging road in sight. Getting into the village does not require nerves or steel and when we arrived snow chains and winter tyres were not needed. 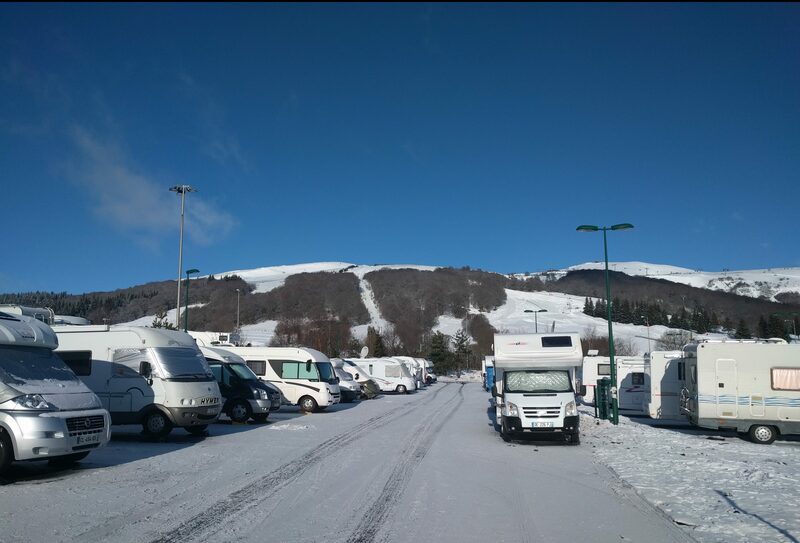 The four main selling points of this resort are its location, Motor home accommodation’s, night skiing opportunity and over all value for money! 1. Its not all about the money! Far and away the cheapest ski resort we have found to date. A days ski pass including insurance sets you back only €35 (€32.50 ex insurance) per person and for an extra €7.50 you have the option to ski under the flood lights until 8.45pm. In addition a coffee break or lunch stop at one of the restaurants wont break the bank. You can expect significant change from €10 for 2 coffees which is rarity in Alpine resorts. 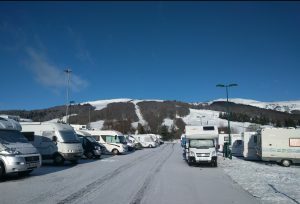 Super Besse is situated in the Massif Central area of France and within the Grand Sancy Ski domain. Being centrally located its only a 7 hour drive (doing Motor Home speeds) from Le Harve and Caen which is handy if you choose to take the overnight ferry from Portsmouth because you can be in resort by late lunch without a lot of effort. Unlike a lot of resorts the motor home aire is actually better positioned than a lot of the permanent accommodation’s. Despite arriving during the busiest week of the season when the French and English schools were on half term break the aire was not full and could comfortably accommodate close to 100 vans. Most pitches had access to mains power and the overnight costs were reasonable. A single night stay will set you back €9.60 which includes free water and waste disposal. Power can be purchased for €2.50 for 4 hours which whilst not cheap use of generators was not frowned upon. The aire also offers a daily gas rental delivery each morning which is handy if you run short (note you will need to sign a French gas rental agreement). All facilities can be paid for at the aire entry via an automated machine. The pay point operates in multiple languages so limited French is not an issue. Barrier entry to the aire requires input of the code purchased at the little hut on arrival and the whole area is floodlit over night and felt very safe. It was a friendly little community. One of the biggest perks of the resort has to be the night skiing. As soon as the sun sets a number of pistes are illuminated and the snow sports continue. That includes the jumps park for those with skillz or no fear. The only downside of this is the condition of the pistes. After a long day of use during sunny days the pistes do become a bit moguley and slushy which then refreezes at night so evening descents can be a little sketchy. During our stay we didn’t see another English van and the resort does not seem popular with the Brits. English speaking attendants at the ski pass shop seems to not be mandatory (as you would expect in larger resorts) and we found English speakers were not in abundance so our French skills were tested. Having said that everyone seemed more than happy to tolerate our broken French and we didn’t feel uncomfortable. Advice would be to at least try though! This resort is not huge and with only 45k of pistes and a smattering of lifts some may get a little bored of doing the same runs over and over again but its layout, services, relative cheapness, location and family friendly vibe make it somewhere we shall be returning to in the future.